RummyCircle has announced a new rummy bonus offer for November which will boost every cash rummy player’s account with 20% bonus on his deposit amount. The offer will run on 5th and 19th of November 2017 and can be claimed by using a special code on each day. If you are looking to play rummy win cash, grab this offer to boost your account and play more real money games. If you are still a free rummy player at RummyCircle, you need to make a minimum deposit of Rs.100 and play one cash game to get counted as a cash player. Once you become a cash rummy player, you will be eligible for all upcoming promotions, tournaments and offers. How to Claim Sunday Bonus Offer? The Sunday Bonus Offer will run on 5th and 19th of November between times 4:00 PM and 10:00 PM. 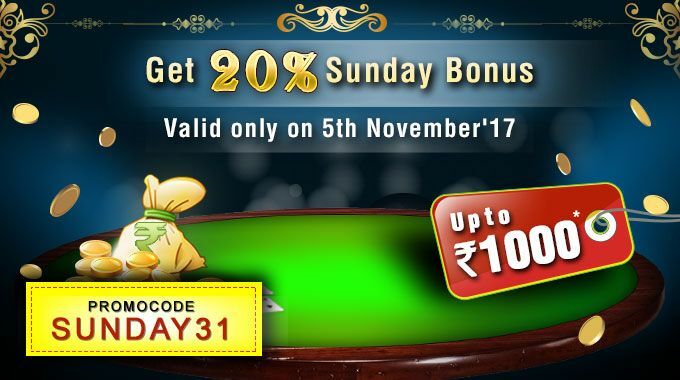 The players at RummyCircle need to deposit with code SUNDAY31 on 5th November to avail 20% bonus up to Rs.1000. To claim the offer on 19th November, the players need to use code SUNDAY32. The rummy bonus credited to a player’s account will expire in 4 days from the date of issue. So, make sure you play rummy for cash for extra hours to make the most of this offer. So, have more fun with real money games every Sunday at RummyCircle. If you have already redeemed this offer, let us know views by posting a comment below!